At first glance, a Rabbi giving the address in a Baptist church as part of a Baccalaureate for a Presbyterian University sounds like the beginning of one of those old jokes that started like this “a Rabbi, a Priest and an Imam walk into a bar…” Yet the multicultural and interfaith nature of this day is no joke. It is the way of the world. It is the way of Queens. A Baccalaureate is a centuries old religious graduation tradition where we take a quiet moment to reflect on the monumental moment you will experience tomorrow morning. Welcome to Queens University of Charlotte’s first Interfaith Baccalaureate service. Texts have been shared from the Hebrew Bible, the New Testament and the Quran reflecting on our roles and responsibilities as human beings. Each one of us and each one of the texts we individually deem sacred has wisdom to share. Some of you might still be asking, what are we doing here? For me, this moment represents going out into the world. 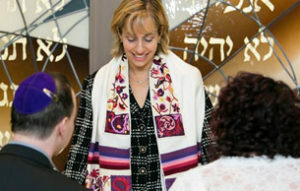 I’m leaving my comfort zone where I have been for 18 years at Temple Beth El to join the faculty of Queens University to teach Jewish studies and to learn from inspiring students like you. I couldn’t be more excited. For me this is comfortable. I have preached in this Baptist pulpit many times. For you, likewise, this moment represents going out into the world. You are leaving your comfort zone. For four (or more years) you’ve been here, learning, many of you growing into adulthood, creating friendships that will sustain you throughout your life, finding your passion and for some of you finding a professional direction. For you this is comfortable. Going into the world was part and parcel of your Queens experience. Your class has given tens of thousands of hours to helping and healing our world through community service. You each have interned at businesses and not-for-profits. The vast majority of you have travelled overseas. So what are we doing here? We are in a sacred place to reflect on this major milestone in your lives. You come together with many strength, from many backgrounds and many faiths. Celebrating diversity, embracing inclusion, working for justice — that is Queens University at its best. That is our world at is best. You each are ready. When we ascend to summits of our lives, our task is to appreciate the view. Queens Class of 2016 — appreciate the view: your friendships, your faculty, your families. Queens Class of 2016 – appreciate this moment of standing on the summit. For you climbed a monumental mountain to get here. As you climbed, you carried in your metaphoric backpacks many character traits that will help you in the future. To get to this high place along your journey through life you each carried wisdom, perseverance, commitment, vision, and friendship. Now sometimes when people get to summits they thank God. “Thank God, I passed all my exams,” some of your whispering. “Thank God, I made it to graduation,” others are reflecting. And you are not alone. Your professors, your parents, and the leadership of this fine institution are thanking God. They, too, are thanking God that you made it and they are thanking God, that you have become the thoughtful and fine human beings that you are. When we stand on summits, gratitude comes naturally. Yet when we descend into valleys of hard times, even some religious people begin to question themselves and to question God. I share with you one of my favorite stories on this topic. There were two siblings. They often got into trouble. The mother brought the younger boy to the church near their home to see if the priest could talk some sense into her son. “Where is God?” The Priest began. The little boy was silent. Again the Priest asked, “Son, where is God?” The boy looked down giving an unknowing look. There are times when we watch the news late at night or when we open our papers first thing in the morning when it feels like God is missing… and you know what we do have something to do with it. When we close our eyes to the problems of our world, when we close our ears to the calls for help, and when we close our hearts to the pain of injustice and inequity… we indeed close our eyes to God. There are times when God is missing. There are other times, such as now, when God can be found. This weekend, we find God in all of you. You are successful. You are capable. You set your sights on high goals and you reach them. Yet as we leave this commencement weekend and head into the world, as the siblings in the story feared, we might sense that God is missing. God is missing in the homelessness that fills our city streets. On any given night in Charlotte-Mecklenburg, there are approximately 2000 people experiencing homelessness. In any given year, 4700 children in our county’s schools are without a home. God is missing in the inequities of our educational system. The schools of our state are marred by inequity in education and overwhelmed by poverty. Each second, one billion people in our world are experiencing hunger. While there is enough food for all, food insecurity plagues millions in our own country. Racial injustice, economic injustice, millions of refugees displaced globally, the list is long of circumstances in which God’s presence is hard to see. Just as the little boy in the story said with fear to his sister, “God is missing and they think we had something to do with it.” Today, we do have something to do with it. Queens Class of 2016, you know well that we find God not in what we have but in what we do with what we have. As Jeremiah said: Seek the peace and prosperity of the city in whichyou live… because if it prospers, you, too, will prosper. As Jesus said: blessed are those who hunger and thirst for righteousness, for they will be filled. As Mohammed said: Those who deny the Day of Judgement drive away the orphan with harshness and do not encourage the feeding of the poor. They make a show of piety and refuse to share the necessities of life. These faith leaders call us to find God through our work of lifting up others. There are those who erroneously think that success can be reached by racing far and fast before others: by out-earning their neighbors, by out-spending their neighbors, by climbing higher than everyone else on the ladder of what they call success. The next morning an American climber named Dan Mazur was on his way to the summit. He spotted Hall, delusional, frostbitten, having slipped off several layers of clothing, but alive. Mazur immediately abandoned his quest for the summit. He gave him oxygen, covered him with more clothing, and helped haul him down the mountain. Life is not about climbing Mt. Everest alone. It is about taking others with you on the journey. It’s not about reaching summits by yourself, it’s about not leaving people behind. It’s about creating a society in which we do not abandon anyone, but embrace all. God is missing but God can found — not only today, but every day. God can be found when we see and honor the spark of the Divine everywhere and in everyone and when we take responsibility for those around us. Queens Class of 2016 – in your lives you will face mountains of challenges. In your lives you will endure valleys of disappointment. In your lives you will walk through the deserts of loneliness. Having others with you will make the painful moments bearable and celebratory moments even greater. So if you found yourselves asking, what is a Baccalaureate service and what are we doing here? We are here to celebrate our standing on the summit together. Queens Class of 2016 – today we can see and appreciate the view of your success so clearly. Before I conclude, I want to tell you about my favorite memorial in Charlotte that has a lesson to teach for all of us. You see it is easy to get lost in life and it is easy to get lost on our Charlotte streets. The most confusing intersection of our city is but five blocks away where Queens and Queens meet Providence and Providence. What I love about this juncture, which my husband refers to as “amen corner,” is not the roads changing names. Nor is it the two established Charlotte churches sitting on one lot that confuse any visitor. What I love most about this corner is the statue that stands out front. It is a bronze figure of a gentleman whose name was Hugh. Each and every day, Hugh directed traffic sending people in the right direction. There was a stoplight then as there is today; but once the light would change, Hugh would wave on traffic, say hello and brighten everybody’s day. This man, who had a simple mind and lived with his mom throughout his life, found his passion doing what he did best. That made him worthy of the most frequently viewed memorial in town. Queens Class of 2016. Be yourselves. Be your best selves. Allow the spark of the Divine to shine through you onto others. As you find your directions help others to find their direction too. And as you do, you will climb summits, again and again, not alone but with others by your side. So what are we doing here? We are here to celebrate. Queens Class of 2016 – we celebrate this summit of your success, this summit of graduation. Queens Class of 2016 – we celebrate the spark of the Divine within each of you: your intellect, your ambition, your kindness, and your compassion. Queens Class of 2016 -we celebrate you. You each are a success and we have faith you will continue to be a success each in your own way. May the source of life bless you. May the source of life watch over you. May the source of life enable you to use your gifts to climb mountains, again and again, as you bring the light of healing, peace and the Divine to our world. Amen.